I've had a couple glasses of wine,so things could get out of hand. Every year around this time we all see the flood of commercials about love and romance. The shareholders at hallmark and every chocolate company in the world begin to plan their summer vacays. They are banking on the fact that we don't know the facts. Now before we begin,let's get it out of the way,I'm not anti-valentines day. When a woman writes an article like this, the general perception is that she is a lonely spinster, heartbroken over a man,or just pitiful. I am neither of those things. I am just a woman who now realizes that the love I seek has to come from me first. I hope that each person celebrating valentines day is aware of their worth,and not using participation in or lack there of to define if they are loved or not. If you are that consciously evolved person,then leave a comment below to help get the rest of us to where you are;and if you are not,listen the hell up!! You are what you seek! In today's society the wires are a little crossed. Everyone is living their "truths",and the traditional lines have been blurred,but somehow one thing remains the same. Women are still being defined by their role in a relationship,but which one? The role as a business woman is on a glorious rise,being a breastfeeding mother has new public fame,and being a wife who keeps it all running smoothly is finally getting it's name rolling in the credits. So what is the problem? The problem still remains that women sometimes live these super human existences and don't feel complete. Some of us are still trying to "do it all" as a way to say we are equal to men,or to prove the masses wrong, and we aren't really taking care of ourselves. We have finally got to realize that if we were all alone,we have all that we need inside. The life and love we want comes from ourselves. What is it about us as women that allows ourselves to be continuously pushed to the back without speaking up? We have to undue the mind games that have been played on us,and get to the heart of the matter. The truth of the matter is that we are fearfully and wonderfully made. I can send myself flowers just for the simple fact that I love flowers,I can take a walk on the beach because I like to see the tides come in,and I can buy myself a diamond,because yes they are a girls best friend,and i've worked hard and earned it! We have been trained to associate these activities with romance between two people, but they don't have to be. When did going out to eat for dinner become exclusive to a man/woman relationship? How about a girls gotta eat,and sometimes she wants to sit and have nice service and leave a big tip? The things that you are waiting to get from entering a relationship with someone else are available to you now. You don 't have to wait until you are in a relationship to enjoy life. When you go and live your life to the fullest,then when you finally do get into a relationship with someone else,you won't feel like you're missing something if you two aren't glued at the hip. If you meet someone who doesn't enjoy reading books,it's OK ! You've been an active member of your local book club,so the outlet you need is still attainable. You can kiss them on the forehead,say "be back soon",and go get what you need. When you meet up again,there isn't resentment,there is understanding and fulfillment. Now don't miss this: If someone really loves you,they will attempt to try out your interest and vise versa,however you don't want to date yourself. You want to be able to learn from each other. If the only way you'd get to enjoy books or whatever it is that you like,is if your partner has the same interest,then you have a big chance of being miserable. The odds of people having the exact same interest from A-Z is very unlikely.The trick to being able to be fulfilled is to know what fulfillment looks and feels like for you. One of the main reasons for this is that people treat you how they see you treat yourself. If you have fresh flowers sent to yourself, or just around your house,then your love interest will know, flowers are something you require.Unless they are an idiot,you won't have to beg for flowers. The other reason for giving yourself what you want is to have the need met, no matter if you're in a relationship or not. Having a fulfilled love of self is also important because you can be open to allowing people to express their love for you in various ways. If you are only looking for love to appear in the form of flowers and candy,then a man who takes out the trash without asking won't be as appealing to you.You may over look this task (that most women hate) as his way of showing affection. Men have a built in mechanism that wants to protect and wants to be needed. If you stop and think about it,so do women,we just show it in different ways. A man may take out the trash, or change the light bulbs,where as we may straighten his tie,or make a sandwich for lunch. Ultimately it's all an expression of love. I firmly believe that we as women need to know that we attract what we are! If we are full of love,then we attract love,if we are needy,then we attract needy. I'm not talking about wanting someone. Wanting someone for sheer pleasure and the joy of their company is different than,needing someone to feel like someone.Have you ever had a friend or been the girl,who is always in a relationship? That woman is scared of her shadow. She thinks that in order to feel beautiful or special,she needs a man to validate her existence.That woman is who you hear about on snapped. The woman who starts off sweet and becomes possessive and jealous. Her whole life is wrapped up in the other person,so keeping tabs on him can get pretty damn urgent! !That isn't the woman you were born to be. 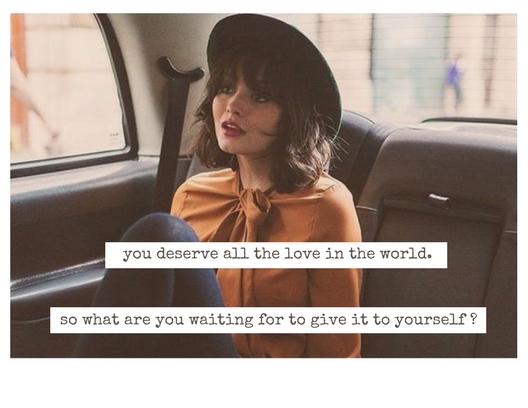 Loving yourself may be hard. You may have come from an abusive past, and have really low self esteem. I'm here to tell you, that girl,you are beautiful. The person who abused you was dealing with their own demons,and as hard as it may be,you've got to heal from the past. Be patient with yourself,but start by saying that today is a new day. Take small steps to take your power back.No matter what your road in life has been,it will still lead you to somewhere great,if you start new. Start by not accepting things that don't fit who you want to be. If you want to be a business woman,then spend your extra time working on that. Going out every weekend may not fit being a business woman. The extra money you need to start the company,is being spent in the wrong places. Make choices that will change your life for the better. Whatever you decide to be in life is possible,but first decide to love yourself.Loving yourself sets up boundaries. It puts a barrier up between you and anything that is against the greatness of you. When you love yourself you are able to recognize what is toxic much faster,and are strong enough to rid yourself of it. Not loving yourself makes you weaker to negative experiences. Loving yourself keeps you in a deeper connection to yourself. Love yourself all year round. Figure out what you want and give it to yourself. In the words of our Hippe of the Month Diane Von Furstenberg,"the most important relationship you'll ever have,is the one you'll have with yourself." I challenge you to fall deeply in love with yourself and go live the life you see in your dreams.